Greyhounds tracks around Ireland are experiencing massive financial losses, the latest Irish Greyhound Board annual report has revealed. 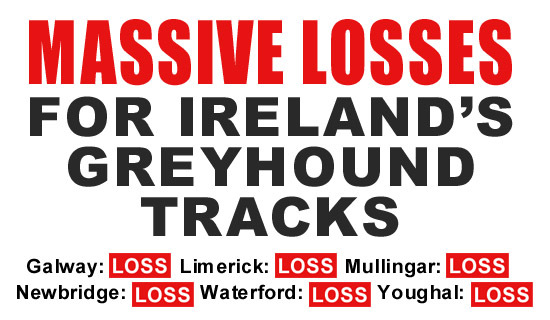 Limerick greyhound track (the Irish Greyhound Board's headquarters) also had a huge overall loss of €176,132. Abargrove Limited, the Irish Greyhound Board's food and drinks subsidiary - which also operates Newbridge greyhound track - recorded the biggest loss of all at €261,639. The IGB accounts show that along with the now-closed Harold's Cross track, just three of its remaining tracks recorded an overall profit. They were Dublin's Shelbourne Park, Cork's Curraheen Park and Tralee's Kingdom track. The losses reflect the Irish public's growing rejection of greyhound racing as more and more details emerge about the doping of dogs (to affect the outcomes of races) and the animal cruelty and killing inherent in the industry. According to the latest figures, track attendance for 2016 fell to 636,914 - an almost 50 per cent drop in the past decade alone and the lowest level since records began. The IGB's previous accounts for the year 2015 showed overall losses for the same tracks as well as for the Kingdom track in County Kerry and a nearly quarter of a million loss for the food and drinks subsidiary. In a submission to the Public Acccounts Committee last year, the Irish Council Against Blood Sports highlighted a statement from the Greyhound Owners and Breeders Federation which claims that when prize money payments are taken into account, "Shelbourne Park is actually another loss making venue for the IGB...The bottom line is that Shelbourne Park needed €34,972 of tax payers' money to shore up its losses in 2015." While figures are not currently available for privately-owned tracks, it is believed that they too are making substantial losses. For example, Longford greyhound track (owned by a Scottish businessman) came close to closure last year, saved only after a fundraising drive and continued annual cash injections of over €40,000 from the Irish Greyhound Board. Don't attend greyhound races or fundraisers/hen parties/office parties held at greyhound tracks (these are a significant source of funding for the greyhound industry). The cruel and crumbling greyhound industry has received nearly a quarter of a billion euros of taxpayers' money since 2001 (including €16 million for 2018). Urge Taoiseach Leo Varadkar and Finance Minister Paschal Donohoe to end funding to the greyhound industry. Urge Taoiseach Leo Varadkar and Finance Minister Paschal Donohoe to end funding to the greyhound industry.